In May, the city of Tukwila released plans to build a sports arena just east of Southcenter, with the goal of bringing championship sports to the city. As anyone who passed within a mile of Starfire Sports on the last three weekends would attest, though, Tukwila has been hosting championships for quite a long time already. The roars that could be heard from all neighborhoods around Starfire over the past month weren't for the Seattle Reign or S2, but rather for the incredible goals, physics-defying saves and other memorable plays being made by Washington Youth Soccer teams in the Washington Youth Soccer Founders Cup, Virginia Mason Washington Youth Soccer Presidents Cup and Virginia Mason US Youth Soccer Washington State Championships. 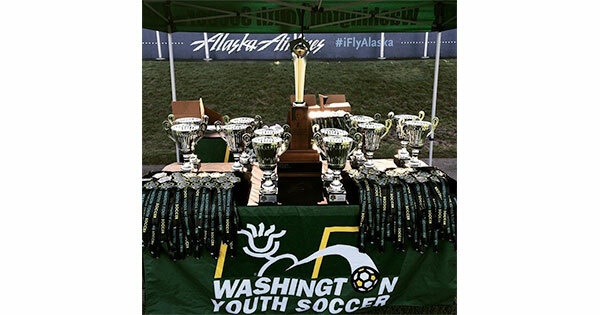 The three Washington Youth Soccer State Cup competitions, each offering its own level of competition and advancement, are the capstone events to the 2014-15 soccer season, giving teams from around the state the chance to go beyond their league and district boundaries and test their skills against other top squads statewide. After months of preliminary round games in their home areas, the final four teams in each age group descended upon Starfire Sports over the last three weeks to determine which team has the right to call themselves by the highest title given to any Washington Youth Soccer team — State Cup champion. The Virginia Mason Washington Youth Soccer Presidents Cup kicked off first, with semifinals and finals in the U10 and U11 age groups taking place Apr. 25-26 (click the following link for video highlights from the weekend! ), followed by the U12-U14 age groups the following weekend, and finally the girls' U15-U18/19 age groups on May 9-10. Winning teams and select wildcards in the U13-U17 age groups advanced to compete in the US Youth Soccer Region IV Presidents Cup, being hosted this year at Stocker Fields in Snohomish (click here to learn how you can volunteer at the event!). The state's highest level of State Cup competition is the Virginia Mason US Youth Soccer Washington State Championships, which crowned winners in the U12-U14 age groups May 2-3, and in the girls U15-U18 groups the following weekend. Each of those winning teams, plus select wildcards, advance to the US Youth Soccer Far West Regionals in Boise, where they'll battle state champions from throughout the Western U.S. for berths at July's US Youth Soccer National Championships. In addition, the top developmental squads in the girls' high school age groups gathered for semifinals and finals of the Washington Youth Soccer Founders Cup, also held on the second weekend of May. Congratulations to all of the winning teams, and to the many squads who earned the right to compete in semifinals at Starfire! For complete results of all Washington Youth Soccer State Cup competitions, click the "Tournaments" tab at the top of this page. And to see hundreds of photos from all State Cup competitions, "like" the Washington Youth Soccer page on Facebook!